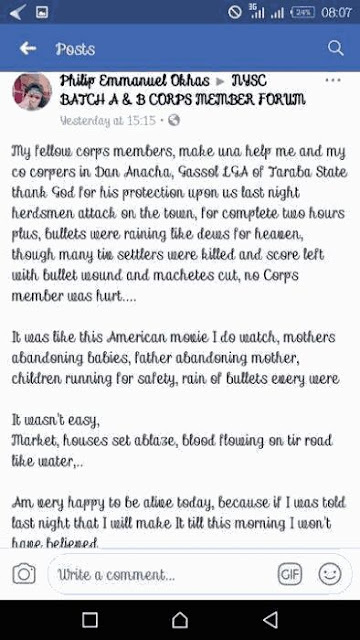 A Corps Member serving in Dan Anacha, Gassol Local Government area of Taraba state was thankful to God for saving his life from the Fulani Herdsmen massacre that occurred in his state of deployment. The young man shared his experience on his Facebook page yesterday. “My fellow corps members, make una help me and my co corpers in Dan Anacha, Gassol LGA of Taraba State thank God for his protection upon us last night herdsmen attack on the town, for complete two hours plus, bullets were raining like dews for heaven, though many tiv settlers were killed and score left with bullet wound and machetes cut, no Corps member was hurt…. It was like this American movie I do watch, mothers abandoning babies, father abandoning mother, children running for safety, rain of bullets every were. It wasn’t easy, Market, houses set ablaze, blood flowing on tir road like water,..Am very happy to be alive today, because if I was told last night that I will make It till this morning I won’t have believed. Make una help me thank God”.